Greetings, this blog will not be updated until after the new year, I will be on holiday until then. I wish you all an amazing holiday season. Best wishes to you and yours. We will be visiting family in Kentucky and Tennessee. I am excited to go but at the same time I will miss Los Angeles on Christmas day. We more often than not have beautiful weather on Christmas Day. Blue skies, warm weather and a slight Santa Ana wind condition. 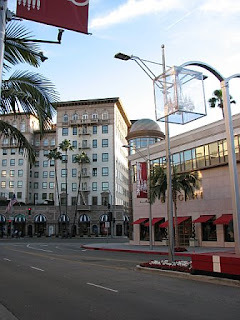 One of my favorite things to do on Christmas day is to go into Beverly Hills. It is a very surreal scene. Beautifully decorated store fronts, windows and those amazing baccarat crystal chandeliers. Not an automobile or person on the street. It is just you and a few fallen palm fronds on Wilshire Boulevard. The city starts picking up with activity about noon with people going to a few restaurants and walking up Rodeo drive looking in the windows. I typically head over to Jerry's Deli for a mean Pastrami on rye and perhaps a bowl of Matzo ball soup. Whatever you are doing for this holiday, I hope you find it more than enjoyable and full of love. sidebar: I got an iphone for Christmas. Love it! See you in 08. Wow! Is this decade flying or what?